If you’re in the mood for comfort food, look no further than this recipe. 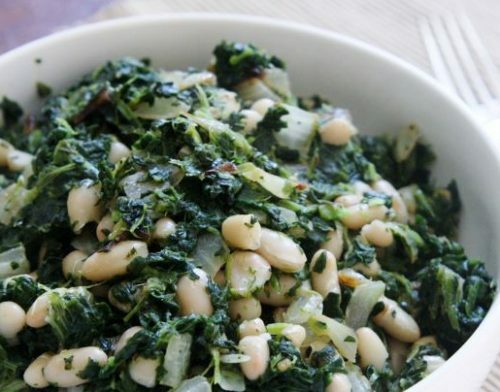 A delicious dish of beans and greens can be customized using many different combinations of beans and leafy greens. This week our focus is on mustard greens. When cooked until silky smooth, mustards are especially delectable paired with a protein- and fiber-packed legume. * Note: To save some time, feel free to start with two 16 oz cans of white beans or chickpeas. If using canned beans, skip the first 4 steps of the recipe. In a pot over medium heat, add the greens, chop and add the (peeled) onion, add the drained beans, some water, and salt and pepper to taste. The bay leaf and clove are omitted in this variation and the onion is not removed in step 6. Put the dry beans in a large pot with water and bring to a boil over high heat. Cut a slit in the onion and insert the bay leaf and clove, place the stuffed onion in pot with the beans. Lower heat to simmer, cover partially, stir occasionally. When the beans begin to soften (30-60 mins), sprinkle with salt and pepper. Continue cooking, stir occasionally, add water as necessary, until the beans are tender but intact (approx. 30-60 mins more). Add the greens and cook until they are tender, 10 to 30 minutes.